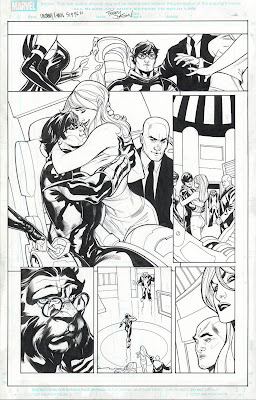 The above image is a full size scan of the original artwork from a page of Uncanny X-Men. Here are the specs for the paper (I draw on for Marvel). The board (paper) is Vellum (rough) 2 ply strathmore 500 series bristol board. The board itself is 11" x 17". The visible border on the art above is 15 3/4" x 10 1/4" and that is the bleed line (which I draw in for my own reference, I'm not aware of anybody else that does this). Nothing prints outside of this area (especially not the black line that I draw in). The panel line area (live art area) is 9 1/8 x 14 1/2". Everything in this area definitely prints.